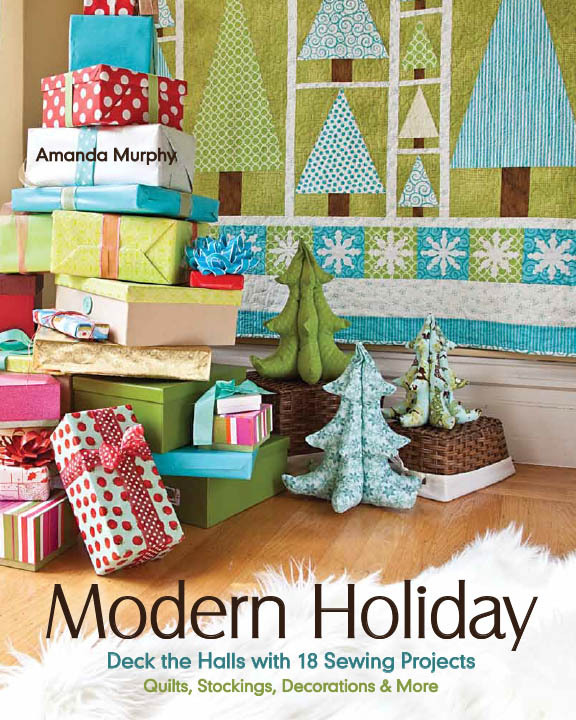 Amanda Murphy Design: Modern Holiday! I am pinching myself! My first book, Modern Holiday, will debut with C&T Publishing this spring. I know it is unfair to show you Christmas projects and tell you they will be available for next Christmas, but I AM SO EXCITED!!! And this is really the perfect time to announce it because every single project in this book was pieced (and occasionally quilted) from start to finish on the Bernina 580! Modern Holiday is chock-full of fun and colorful Christmas projects for the modern quilter. There are 9 quilt and 9 different types of accessories. I hope you love it and can't wait until it is time to share more!!! So happy for you! Can't wait to see it! Oh my heck!! I'm thrilled for you. And, since I've made a solemn vow to work on Christmas projects all through 2013, April sounds like a splendid time for a Christmas book. Sign me up! Congratulations! I too love the cover photo. It is now on my wish list. I can't wait to see it in person. Great to see you last night! Congrats on the book....looks like a 'must have'!!!! Oh how pretty all that is. Congratulations on the book. I can't wait to have one of them in my hands. Oh Congratulations! This is a book I will own! Love the cover photo! Congrats! hope you will share more about it later. Congrats! Such exciting news and I'll look forward to hearing more. Wahoo! If the cover is any indication this is going to be great! Can't wait! I have my fabric ready to begin cutting out Sunflower row. I hope to start the first week in January after we drop our daughter back at school.